I love coming up with new recipes for cooking venison as well as, showing our friends and family, who may not hunt, just how we harvest the food at our ranch and bring it to the table. I think it’s so important to utlize what we have worked hard for all year so that we may enjoy it over dinner with family and friends. Now my family tends to get bored of the same ole’ venison recipes. So I like to mix things up a bit. For this recipe that I came up with I took something at the store that always had me scratching my head over what someone would use it for. I’m glad I did. It turned out great and I’m happy to share that with you. I always see these jumbo shells at the store and I’ve often wondered who eats those ginormous things and what would anyone do with them? Right? So I decided I’m going to do something with these shells. I took one of my tortellini recipes and instead used the jumbo shells. I finished it off with a combination of three cheeses as well…you know, to mix things up. It’s really simple. It only took me 45 minutes from start to finish. I hope you enjoy this as much as my family did. It turned out to be a delicious venison cheesetastic dish. Brown the 2 lbs of ground venison pan sausage. Once the pan sausage is fully cooked add the spinach, salt and pepper. Cook till spinach wilts. Then, stir in vodka cream sauce, Italian seasonings and sriracha sauce. Let cool. Turn off burner and let the mixture cool down. While you’re letting this cool is a good time to cook the shells. Bring a pot of salted water to a boil. Drop in shells and cook till al dente. Drain and let shells cool. Now, go back to your cooled venison sauce and stir in the two Ricatta Cheese containers. Grab a 9 X 13 inch baking pan (or similar) and coat with olive oil or non stick spray. Preheat your oven to 375 degrees. 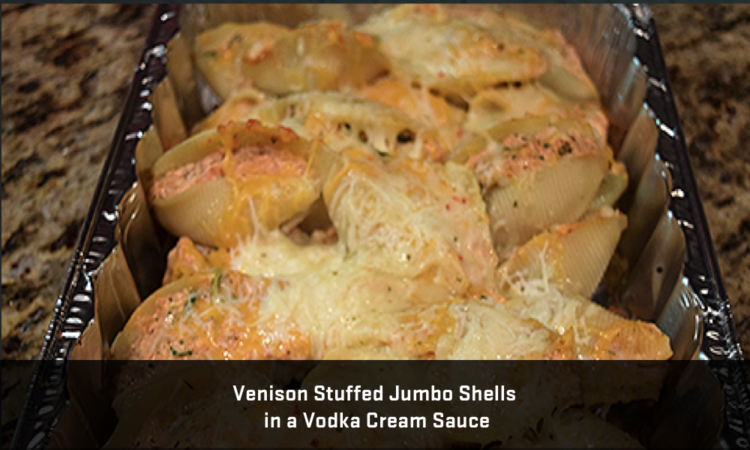 Start stuffing your shells with the sauce mixture and lay them in your pan. You can stack them on top of one another to. When you have them all stuffed start sprinkling your cheeses all over the top. Feel free to add more. Bake in oven for 20 minutes. I served this dish with a ceasar salad and garlic bread. This dish goes really well with a Pinot Noir. My family absolutely loved it and wants me to make it again like right now. Haha. I will no longer look at these jumbo shells and wonder what do people do with these. In fact, I’m working on another dish that includes these shells right now. I enjoy bringing our hunt to the table and sharing with friends and family. I hope you and your family enjoy as well.